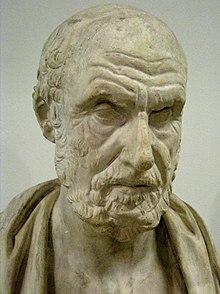 Hippocrates (Ἱπποκράτης) of Kos (c. 460 BC - 377 BC) was an ancient Greek physician who is referred to as the "father of medicine". Life is short, and Art long; the crisis fleeting; experience perilous, and decision difficult. Wherever a doctor cannot do good, he must be kept from doing harm. Viking Book of Aphorisms : A Personal Selection (1988) by W. H. Auden and Louis Kronenberger, p. 213. Time is that wherein there is opportunity, and opportunity is that wherein there is no great time. Healing is a matter of time, but it is sometimes also a matter of opportunity. However, knowing this, one must attend to medical practice not primarily to plausible theories, but to experience combined with reason. For a theory is a composite memory of things apprehended with sense perception. Precepts, Ch. 1, as translated by W. H. S. Jones (1923). Conclusions which are merely verbal cannot bear fruit, only those do which are based on demonstrated fact. For affirmation and talk are deceptive and treacherous. Wherefore one must hold fast to facts in generalizations also, and occupy oneself with facts persistently, if one is to acquire that ready and infallible habit which we call "the art of medicine." Precepts, Ch. 2, as translated by W. H. S. Jones (1923). As quoted in Catholic Morality : Selected Sayings and Some Account of Various Religions (1915) by E Comyns Durnford, p. 90. Related to this is the surgery of wounds arising in military service, which concerns the extraction of missiles. In city practice experience of these is but little, for very rarely even in a whole lifetime are there civil or military combats. In fact such things occur most frequently and continuously in armies abroad. Thus, the person intending to practice this kind of surgery must serve in the army, and accompany it on expeditions abroad; for in this way he would become experienced in this practice. Hippocrates - The Physician 14, as translated by Paul Potter, Loeb Classical Library, Hippocrates Volume VIII. Ars longa, vita brevis, occasio praeceps, experimentum periculosum, iudicium difficile. Nec vero solum seipsum praestare oportet oportuna facientem: sed et assidentes, et exteriora. Life is short, and Art long; the crisis fleeting; experience perilous, and decision difficult. The physician must not only be prepared to do what is right himself, but also to make the patient, the attendants, and externals cooperate. 1:1, Variant translation: Art is long; life is short; opportunity is fleeting; judgement is difficult; experience is deceitful. Compare: "The lyfe so short, the craft so long to lerne", Geoffrey Chaucer, The Assembly of Fowles, line 1. Extreme remedies are very appropriate for extreme diseases. Compare: "A desperate disease requires a dangerous remedy", Guy Fawkes, in admitting to the Gunpowder Plot; "Diseases desperate grown / By desperate appliance are relieved, / Or not at all", William Shakespeare, Hamlet, Act iv, Scene 3; "For a desperate disease a desperate cure", Michel de Montaigne, The Custom of the Isle of Cea, Chapter iii. Those diseases which medicines do not cure, iron cures; those which iron cannot cure, fire cures; and those which fire cannot cure, are to be reckoned wholly incurable. Variant translation: What cannot be cured by medicaments is cured by the knife, what the knife cannot cure is cured with the searing iron, and whatever this cannot cure must be considered incurable. Medicine is of all the Arts the most noble; but, owing to the ignorance of those who practice it, and of those who, inconsiderately, form a judgment of them, it is at present far behind all the other arts. Their mistake appears to me to arise principally from this, that in the cities there is no punishment connected with the practice of medicine (and with it alone) except disgrace, and that does not hurt those who are familiar with it. Such persons are like the figures which are introduced in tragedies, for as they have the shape, and dress, and personal appearance of an actor, but are not actors, so also physicians are many in title but very few in reality. With purity and with holiness I will pass my life and practice my Art. I swear by Apollo the physician, and Aesculapius, and Health, and All-heal, and all the gods and goddesses, that, according to my ability and judgment, I will keep this Oath and this stipulation — to reckon him who taught me this Art equally dear to me as my parents, to share my substance with him, and relieve his necessities if required; to look upon his offspring in the same footing as my own brothers, and to teach them this art, if they shall wish to learn it, without fee or stipulation; and that by precept, lecture, and every other mode of instruction, I will impart a knowledge of the Art to my own sons, and those of my teachers, and to disciples bound by a stipulation and oath according to the law of medicine, but to none others. As translated in The Hippocratic Oath : Text, Translation, and Interpretation (1943) , by Ludwig Edelstein. I will follow that system of regimen which, according to my ability and judgment, I consider for the benefit of my patients, and abstain from whatever is deleterious and mischievous. I will give no deadly medicine to any one if asked, nor suggest any such counsel; and in like manner I will not give to a woman a pessary to produce abortion. While I continue to keep this Oath unviolated, may it be granted to me to enjoy life and the practice of the art, respected by all men, in all times! But should I trespass and violate this Oath, may the reverse be my lot! Tr. Francis Adams, The Genuine Works of Hippocrates (1849) Vol. 1, unless otherwise noted. Whoever having undertaken to speak or write on Medicine, have first laid down for themselves some hypothesis to their argument, such as hot, or cold, or moist, or dry, or whatever else they choose, (thus reducing their subject within a narrow compass, and supposing only one or two original causes of diseases or of death among mankind,) are all clearly mistaken in much that they say; and this is the more reprehensible as relating to an art which all men avail themselves of on the most important occasions... For there are practitioners, some bad and some far otherwise, which, if there had been no such thing as Medicine, and if nothing had been investigated or found out in it... all would have been equally unskilled and ignorant of it, and everything concerning the sick would have been directed by chance. But now it is not so; for, as in all the other arts, those who practise them differ much from one another in dexterity and knowledge, so is it in like manner with Medicine. Wherefore I have not thought that it stood in need of an empty hypothesis, like those subjects which are occult and dubious... as, for example, with regard to things above us [meteorology, astronomy or astrology] and things below the earth [geology, Hades, antipodes, or outside of the Firmament]; if any one should treat of these and undertake to declare how they are constituted, the reader or hearer could not find out, whether what is delivered be true or false; for there is nothing which can be referred to in order to discover the truth. [N]ecessity itself made medicine to be sought out and discovered by men, since the same things when administered to the sick, which agreed with them when in good health, neither did nor do agree with them. But to go still further back, I hold that the diet and food which people in health now use would not have been discovered, provided it had suited with man to eat and drink in like manner as the ox, the horse, and all other animals... And, at first, I am of opinion that man used the same sort of food, and that the present articles of diet had been discovered and invented only after a long lapse of time. ...[I]t is likely that the greater number, and those who had weaker constitutions, would all perish; whereas the stronger would hold out for a longer time, as even nowadays some, in consequence of using strong articles of food, get off with little trouble, but others with much pain and suffering. From this necessity it appears to me that they would search out the food befitting their nature, and thus discover that which we now use: and that from wheat, by macerating it, stripping it of its hull, grinding it all down, sifting, toasting, and baking it, they formed bread; and from barley they formed cake (maza), performing many operations in regard to it; they boiled, they roasted, they mixed, they diluted those things which are strong and of intense qualities with weaker things, fashioning them to the nature and powers of man, and considering that the stronger things Nature would not be able to manage if administered, and that from such things pains, diseases, and death would arise, but such as Nature could manage, that from them food, growth, and health, would arise. To such a discovery and investigation what more suitable name could one give than that of Medicine? since it was discovered for the health of man, for his nourishment and safety, as a substitute for that kind of diet by which pains, diseases, and deaths were occasioned. [A]ll the causes of the sufferance refer themselves to this rule, that the strongest things most especially and decidedly hurt man, whether in health or in disease. I would give great praise to the physician whose mistakes are small, for perfect accuracy is seldom to be seen, since many physicians seem to me to be in the same plight as bad pilots, who, if they commit mistakes while conducting the ship in a calm do not expose themselves, but when a storm and violent hurricane overtake them, they then, from their ignorance and mistakes, are discovered to be what they are, by all men, namely, in losing their ship. [N]o less mischief happens to a man from unseasonable depletion than from repletion... to the bulk of mankind it is of little consequence which of these rules they observe... whether they make it a practice to take one or two meals [per day]. But there are certain persons who cannot readily change their diet with impunity; and if they make any alteration in it for one day, or even for a part of a day, are greatly injured thereby. [W]e ought not to reject the ancient Art, as if it were not, and had not been properly founded, because it did not attain accuracy in all things, but rather, since it is capable of reaching to the greatest exactitude by reasoning, to receive it and admire its discoveries, made from a state of great ignorance, and as having been well and properly made, and not from chance. [O]f articles of food, those which are unsuitable and hurtful to man when administered, every one is either bitter... or saltish or acid, or something else intense and strong, and therefore we are disordered by them... But all those things of which a man eats and drinks are devoid of any such intense and well-marked quality... which man is accustomed to use for food, with the exception of condiments and confectionaries, which are made to gratify the palate and for luxury. And from those things, when received into the body abundantly, there is no disorder nor dissolution of the powers belonging to the body; but strength, growth, and nourishment... for no other reason than because they are well mixed, have no thing in them of an immoderate character, nor anything strong, but the whole forms... [of] simple and not strong substance. Certain sophists and physicians say that it is not possible for any one to know medicine who does not know what man is, and that who ever would cure men properly, must learn this in the first place. 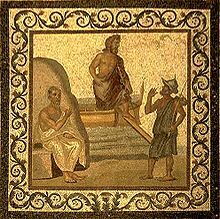 But this saying rather appertains to philosophy, as Empedocles and certain others have described what man in his origin is, and how he first was made and constructed. But I think whatever such has been said or written by sophist or physician concerning nature has less connexion with the art of medicine than with the art of painting. And I think that one cannot know anything certain respecting nature from any other quarter than from medicine... Wherefore it appears to me necessary to every physician to be skilled in nature, and strive to know... what man is in relation to the articles of food and drink, and to his other occupations, and what are the effects of each of them to every one. This page was last edited on 20 February 2019, at 23:24.